Another bonus is that my back stairwell has a landing that is the perfect size for my setup while allowing me to grasp a wall to start or steady myself. Hi Dave. I'm honored you have used a picture of mine, but the copyright/CC requires attribution, which means that the notice of attribution you should give is to me, Steven N Fettig, not flickr.com. (You have attributed it to flickr.com, which is where it is posted, but not who maintains copyright over it.) I see you have copyrighted your works under the same CC license and I mulled over commenting because of how much of a 'non-issue' this is (it's not even a good picture, to boot), but realized that in order for CC to be taken seriously, people should understand what each license means and how the user is to respect it. Anyway, just a heads up. 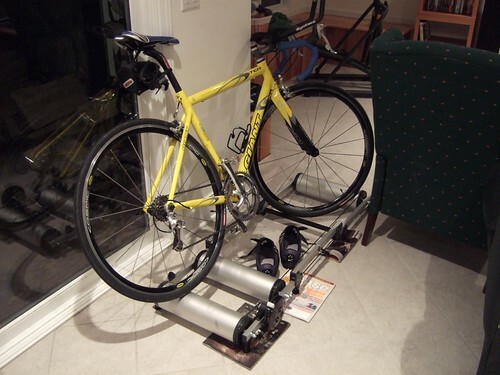 To the point of using the roller: once you get the hang of it, it has an amazingly positive impact on your balance and cadence. I used it only for a few months (on and off) last year - before the weather was good enough to go outside - and was amazed at how much it helped. I almost broke my leg using it, though, and a fair warning to those who do... Don't be lazy, like I was, and leave your clip-in pedals on. It was raining one eve and I was too "busy" to take off my clip-ins. At one point, I lost my balance and fell onto the tile floor you see in the picture; fully clipped in. That's a bruise I won't forget. Otherwise, once you get used to looking slightly down and straight ahead, you'll find riding to be as smooth as if you were on the road.